Some series lend themselves naturally to politics. Green Arrow has been one of those series, ever since Denny O’Neil and Neal Adams got their hands on him back in the early 70s. 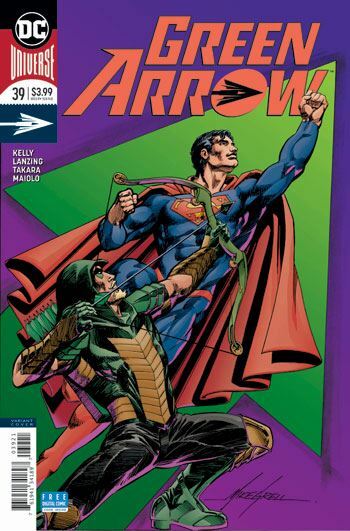 Sometimes Green Arrow is portrayed as a knee-jerk liberal, frequently in contrast to Hawkman. Other times he is shown to be more of a tortured, well-meaning man, trying to find the right way to fight crime and oppression. 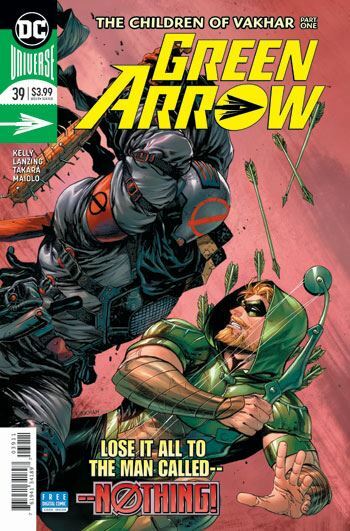 As Jackson Lanzing and Collin Kelly begin their run on Green Arrow, they dive right in to the deep end, sending Oliver Queen to the Middle East. He is trying to skirt all the government corruption in order to help the people there directly, but finds himself quickly over his head. The story bears somewhat of a resemblance to the current story arc that Christopher Priest is relating in the pages of Justice League, though that is set in Africa. In both cases, the people on the ground are being used as pawns by the powers on both sides, and there is little the heroes can do to really help the situation. And, in both cases, these plot lines build out of events from Deathstroke’s book. Green Arrow’s idealism gets pushed to the limits, right off the bat, and the fact that the enemy he is facing is named “Nothing” highlights the bleakness that permeates the story. Marcio Takara does the art on this issue, and it is perfectly suited to the tale. Grim and gritty, Green Arrow is placed into a wasteland of ruins, and all of the characters look like they have seen better days. One can feel the dirt and sweat on all of the characters. This is a damn good start to a run, and though the story does not look like it is going to be a fun ride, it sure looks to be a powerful and memorable one.